Life of a Knitphomaniac: Stress Free, Experimental, Mystery FADE! Hey everyone....how was your week? Mine was fabulous, and I hope yours was too! Darlene finished Shyla's wedding shawl! It is fabulous! So, with Darlene's deadline knitting complete....that meant that she and I can knit something together again (it has been too long since we have done that). Darlene had this great idea.....we could knit Find Your Fade. I have already knit one and she has one on the needles already, but this new one would be different. It would be Stress Free, Experimental and a complete Mystery! I went home and gave Paige about 20 skeins of yarn, and asked her to pick 7 for this shawl pattern (then I added one more because Darlene had a skein of yarn I loved and I really wanted to use in my Fade)....so 8 skeins of yarn. Darlene went home and gave her (color blind) husband about 20 skeins and told him to pick 7...she later asked him to pick one more to make 8. We have another friend, Barbara, who let her hubby pick 7 skeins from her entire stash! Well, we package up all the skeins to where we cannot see what they are. Then, once we are done with one color....we blindly draw a skein from our bucket of skeins and then knit with the one we drew....no exceptions! I started a thread in the Bags By Awesomegrannie group for others to knit along with us if they wanted....we are having so much fun with this....it makes you knit faster because you are dying to know what your next color is. The 8th skein is bonus fun because it is just as exciting to find out what skein will NOT get used. LOL! My colors are very similar (Paige knows me and knows I might not wear it if it not a little neutral), and Darlene's are much more bold and brave....I am loving both the fade's! Other than knitting on this Fade....I also knit on my "And Then Some" Shawl.....I got to 50%....wow. That is all the knitting I did....but, I got some stash enhancements. I got a new "Batik" Northern Light Needle. Shown here with my envy needles. The Batik is the one right in the middle....a touch lighter, but hardly noticeable. I got my yarn from Wool Warehouse. I am sooooo in love with this red (it is called Cereza).....I think it even matches my new car....LOL! 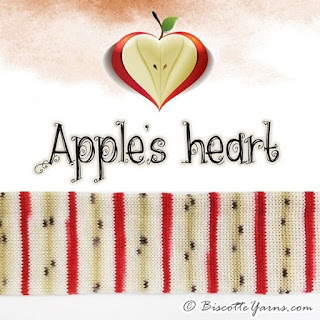 Lastly, I got a skein of the Apple's Heart self striping yarn from Biscotte Yarns. This yarn is the SOFTEST sock yarn I have ever knit with...I really should knit with it more often. Have you noticed I have not started my April socks yet? Well, I am trying to decide if I want to continue my 'Socks A Month' with DVD club or if I even want to keep doing a pair of socks a month at all. In March, there was a colorway contest for "Children's Movies" and there were some great winners. Susan even said that some of them are from the past and some might be used in the future. Then, in April (the very next month) she called for "Animated Movies".....as you can imagine, these are very similar movie categories. In the Children's movies, I recommended Moana. In the Animated Movies, I did not make a recommendation, but someone else recommended Moana, and Susan picked that as her color choice and they won the free skein of yarn from it.....now, I hardly find that fair...but maybe I am just overly sensitive...I think Susan is super generous with all her prizes, but I think she also needs to be fair. So....with all that long explanation, I am struggling with whether or not I want to keep going on with the DVD club, or just knit with some of my other gorgeous self striping yarn! What do you think? Am I being overly sensitive? Antonio and I went to go see my son this past weekend...we had a great visit. and then I noticed that Precious was not feeling well.....this is her with a piece of Soppressata (the best salami on the plant) next to her and she is not even touching it....plus...ever since my friend made Precious her own quilt, Precious rarely sleeps on this older blanket. That is all I have...Have a fabulous week!